Rebuilds the Walls of Jerusalem. Son of Hachaliah; rebuilder of the walls of Jerusalem. The sole source of information about Nehemiah is the canonical book that bears his name, parts of which, at any rate, furnished Ben Sira with the matter for the short notice which he gives of Nehemiah. He was cupbearer to Artaxerxes (identified by De Saulcy with Artaxerxes II., whose reign began 404 B.C.). Owing to a painful report that had reached him of the condition of the Jews in Palestine, he, perhaps with the countenance of the queen-mother or queen, obtained permission to visit Jerusalem, and to rebuild the walls, for which purpose he was furnished with firmans and a supply of timber. Incidentally it is mentioned that he had the title "peḥah" or "tirshatha," equivalent to "viceroy," for twelve successive years (384-372), and apparently again at a later period. The rebuilding of the walls (a task which had before Nehemiah's time been repeatedly attempted) was commenced by him with caution, and excited enmity and even armed intervention, which latter, however, Nehemiah showed himself able to resist. The account of the details of the building is not, apparently, from Nehemiah's hand, and would seem to represent the work as more of a national enterprise than would be inferred from Nehemiah's own statements. The account of the inaugural ceremony after completion comes rather late in the book, and was probably written some years after the event. Nehemiah's opponents appear to have been wealthy landowners, not themselves Israelites, but allied with leading families within the city. After the completion of the walls Nehemiah had to occupy himself with political reforms also, of which one was the restoration to their original owners of lands taken for debt by the wealthier members of the community—a scheme not unlike the "novæ tabulæ" of the classical republics, and regarded by the owners as an ultra-revolutionary measure; for it meant the abandonment without consideration of much property lawfully acquired. According to Nehemiah's account, it was effected with a minimum of friction, owing to his own disinterestedness in relinquishing his claim to the governor's allowances; and it took the form of a cheerful sacrifice on the part of the moneyed class. He tells, however, almost immediately afterward, of attempts on his own life, which he dexterously escaped, and of endeavors to represent his restoration of the walls as the prelude to a declaration of independence. In these attempts residents of Jerusalem took part, either having conspired with or being in the pay of external enemies. Among these instruments were a false prophet and a false prophetess, whom Nehemiah was able to unmask. Nehemiah's next measure would appear to have been as aristocratic in tendency as the last was democratic. He instituted an inquiry into the pedigrees of the residents of Jerusalem with the view of degrading aliens, and for this purpose obtained a copy of the roll of the families that returned with Zerubbabel. His narrative, however, breaks off without describing the nature of the measure which he adopted or the smoothness with which it worked. It appears from other parts of the book that priestly families were connected by marriage with the aliens, and, though Nehemiah resumed his inquisition on his second visit to Jerusalem, it required the arbitrary exercise of power to carry it through. It is possible that the danger of offending the humbler classes, whom he had won over by his "novæ tabulæ," prevented him from inquiring too strictly into this matter on his first visit. The rest of his reforms appear to have been of a religious nature, although, the chapters in which they are recorded being by other hands, there is a want of clearness in the details. He appears with the aid of Ezra to have enforced or reenforced the Mosaic law, especially the provision relating to the sanctity of the Sabbath, which on his second visit he had again to emphasize. He also provided by a regular system of forced contributions for the maintenance of the Temple services and of the various castes who took part in performing them. He writes with unusual naïveté and the accuracy of his personal narrative has rarely been questioned. It seems, however, surprising that the accredited representative of the sovereign court should, in carrying out his commission, have met with fierce opposition, leading to the imminent risk of skirmishesand battles; but the classical historians give no high idea of the administrative capacity of Artaxerxes II. Further, there appears to be some contradiction between the statements that he went to Jerusalem on a visit for a strictly limited time (ii. 6), and that he went to Judea as "peḥah" and held office for twelve years (v. 14 and xiii. 6); but this may also be due to the fragmentary nature of his memoirs. 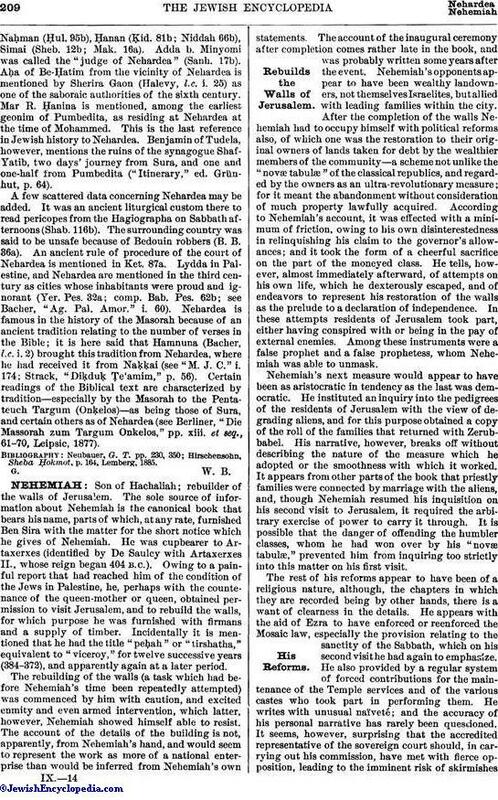 From Nehemiah's own account of his conduct it may be gathered that he was an adroit politician, a wary leader and soldier, and a skilful organizer, though not free from pedantry and fanaticism; and it is probable that Ben Sira, in naming him after Zerubbabel as one of those to whom the Jews owed their restoration and reconstitution as a nation, only does him justice. For without walls Jerusalem could not, according to ancient ideas, have ranked as a place of importance, and the measure, of which there is an obscure mention (xi. 1), of obtaining a resident population fitted for its size, by drawing lots, would also do much toward restoring its former grandeur. His name was, however, not popular with the tradition which has come down in the Talmuds; but in that which is preserved in the Second Book of Maccabees many services are attributed to him of which the Bible knows nothing. Among these are the miraculous production of fire, celebrated by a feast called "Naphthar" (II Macc. i. 36); the compilation of a sacred library (ib. ii. 13); and even the building of the Temple and the altar (ib. verse 18). These statements are not worthy of credit; and it is evident that Nehemiah's personality was overshadowed by that of Ezra, whose services, though less brilliant, were more lasting. Nehemiah is identified in one haggadah with Zerubbabel, the latter name being considered an epithet of Nehemiah and as indicating that he was born at Babylon ("Zera'+ Babel"; Sanh. 38a). With Ezra, he marks the spring-time in the national history of Judaism (Cant. R. ii. 12). A certain mishnah is declared by the Rabbis to have originated in the school of Nehemiah (Shab. 123b). Still, Nehemiah is blamed by the Rabbis for his seemingly boastful expression, "Think upon me, my God, for good" (Neh. v. 19, xiii. 31), and for his disparagement of his predecessors (ib. v. 15), among whom was Daniel. 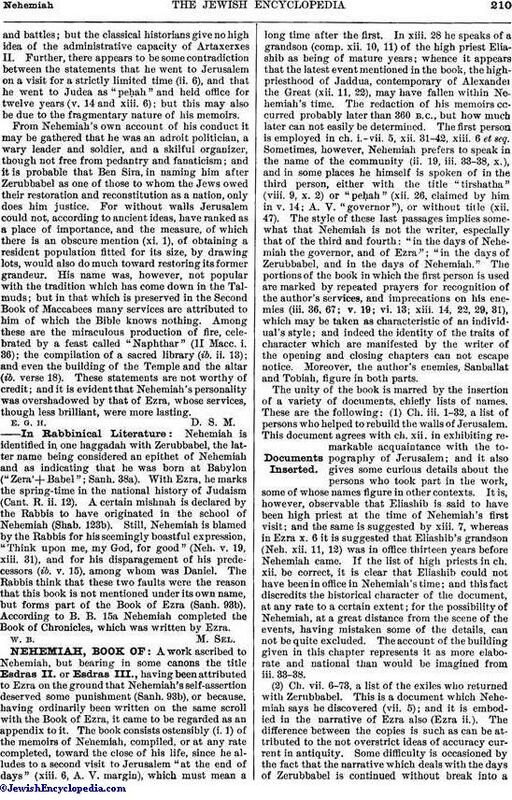 The Rabbis think that these two faults were the reason that this book is not mentioned under its own name, but forms part of the Book of Ezra (Sanh. 93b). According to B. B. 15a Nehemiah completed the Book of Chronicles, which was written by Ezra.